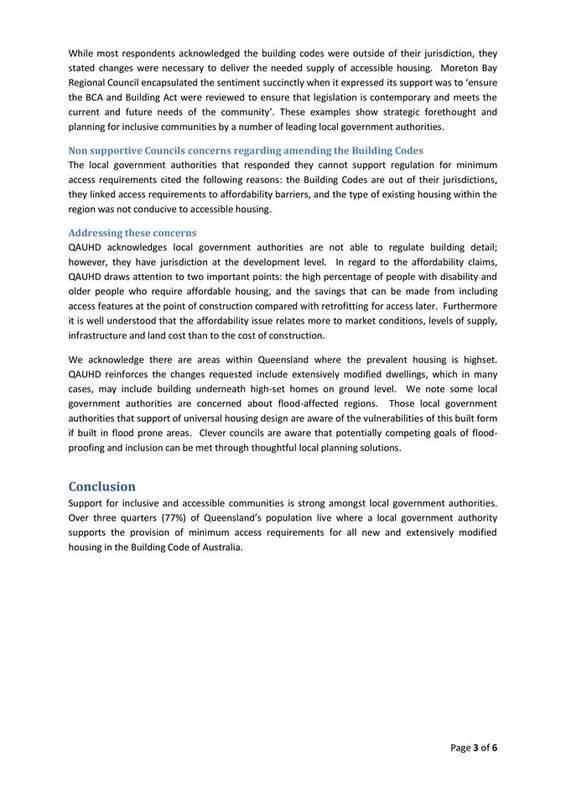 QAUHD wrote to Council last month asking for our support for their proposal for regulation for minimum access requirements in the Building Code of Australia for all new and extensively modified housing. They have requested a response by 30 April for inclusion in a submission they are preparing for lodgement with both state and Commonwealth governments. 3. 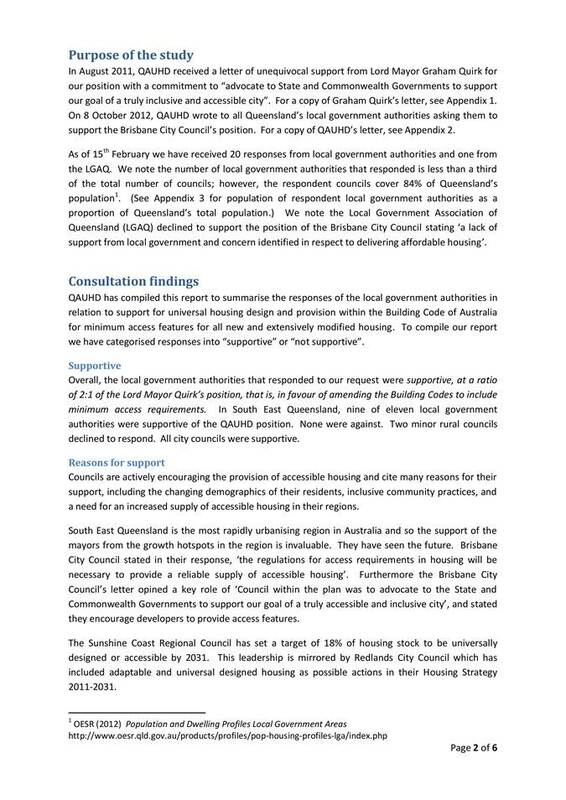 The Brisbane City Council sees they have a key role to advocate to the Queensland and Commonwealth Government to support QAUHD’s goal of truly accessible and inclusive communities in Queensland. In 2012 there were 74 LGA’s. 13 were supportive – 18%. · Slip resistant floors in kitchens, bathrooms and laundries. 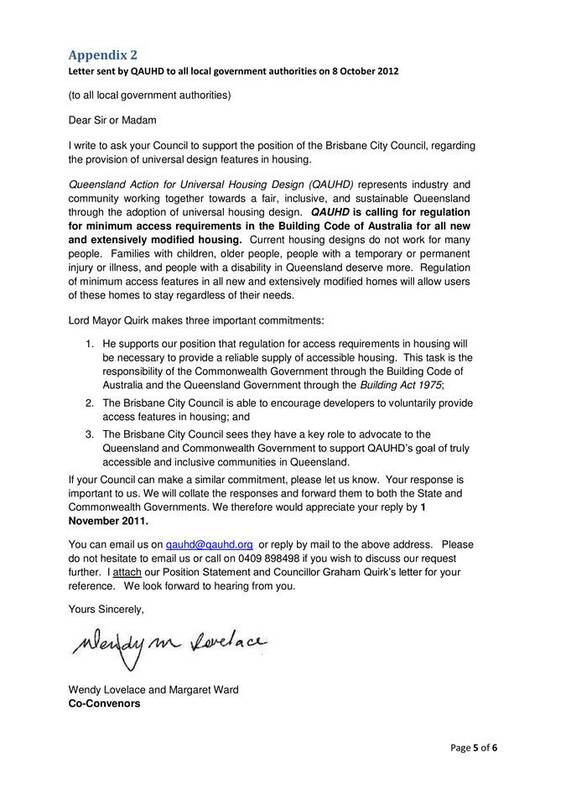 The responses given by Brisbane City Council/Lord Mayor Quirk are fairly generalised comments of support to the concept of enhanced housing accessibility for people with physical challenges, related to both disability and aging. · Single detached housing is generally not subject to planning approval. o The development of highset housing would be substantially limited resulting in a loss of the advantages associated with this, such as flooding immunity, improved ventilation, views etc. o Increased floor areas necessary to achieve an accessible design will limit the intensification of residential development. · Potential conflicts with heritage building provisions and reduced opportunities to extend existing housing. · Regulated building design will limit housing diversity and deny people the opportunity for individuality of design. · Significant increases in housing construction costs. · Less affordable housing as a result of increased construction costs. · Inefficient use of land through the provision of additional floor areas where they are not necessarily required. While the concept of enhancing building access arrangements to improve opportunities for people to live as independently as possible for as long as possible is admirable, using legislation to enforce it is a potentially dangerous strategy. 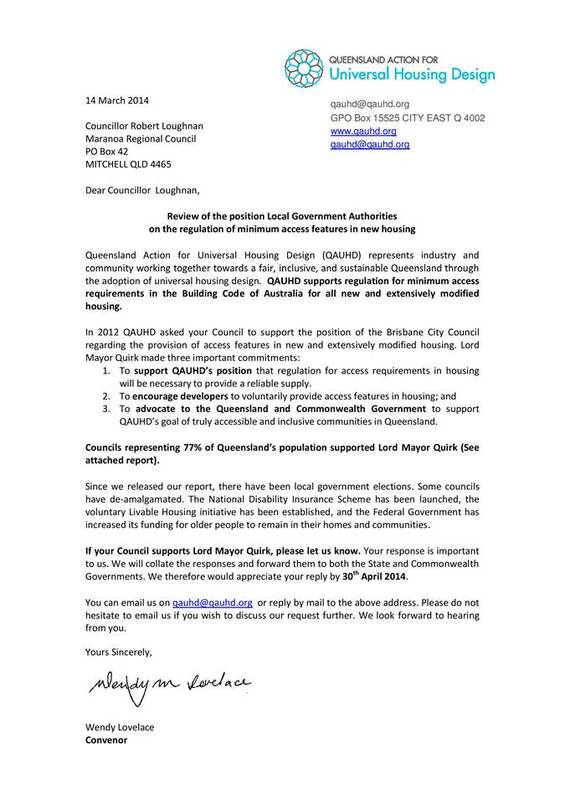 QAUHD seems to be taking any indication of support for their core position as support for significant changes to the Building Code of Australia, and I would therefore recommend that we either respond in a clear negative to this request, or give no response at all. Council has received numerous correspondences from Brenda Hill with a complaint of dust from traffic along George Street East. Ms Hill’s concerns have previously been addressed by Council at the meeting 22 January 2014, in which Council determined that it was appropriate to liaise with Ms Hill in order to construct a dust seal in accordance with the Dust Seal Policy adopted by Council 26 June 2013 (GM/06.2013/38). Since this meeting Council has received more correspondences and other forms of contact from Ms Hill expressing her discontent. Ms Hill has advised that she is not prepared to contribute to a dust seal. That Council uphold its previous decision to apply the Dust Seal process, as per the Dust Seal Policy. Council has received numerous correspondences from Brenda Hill with a complaint of dust from traffic along George Street East. Ms Hill’s concerns have previously been addressed by Council at the meeting 22 January 2014, in which Council resolved that it was appropriate to liaise with Ms Hill in order to construct a dust seal, in accordance with the Dust Seal Policy adopted by Council 26 June 2013 (GM/06.2013/38). This policy was developed with the view of treating each dust seal request/dust complaint in a transparent and equitable manner. 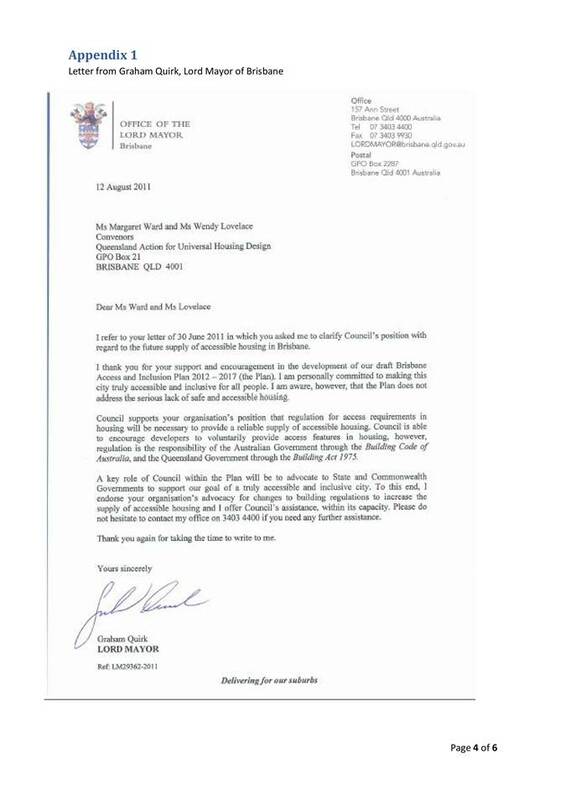 Ms Hill has received a Dust Seal agreement form, a copy of the policy and a letter indicating the outcome of her request at the Council meeting 22 January 2014. Ms Hill has indicated both verbally and in writing that she is not prepared to contribute funds to a dust seal. Ms Hill disputes the chainages on the agreement, she is indeed correct and we welcome this feedback. The chainage should have been written down as approximately 0.57 km – 0.77 km as the report was for a 200 metre dust seal. This may not satisfy Ms Hill in terms of positioning and length however applicants have always been able to have input into the positioning of the dust seal and the length. It should be noted that Ms Hill purchased a block surrounded by road reserve and several roads were already in existence. In response to Ms Hill’s persistent complaints council has conducted a traffic count along George Street East. Traffic counters were placed at (1) east of the intersection of George Street East and Ashburn Road, and (2) west of the intersection of George Street East and Clayton Road from 25 February 2014 to 3 April 2014. The average vehicles per day (vpd) for this period were (1) 135 and (2) 99. Further investigation is required to determine why there is a difference in vpd between the two points and to ascertain if traffic is using Short Street. 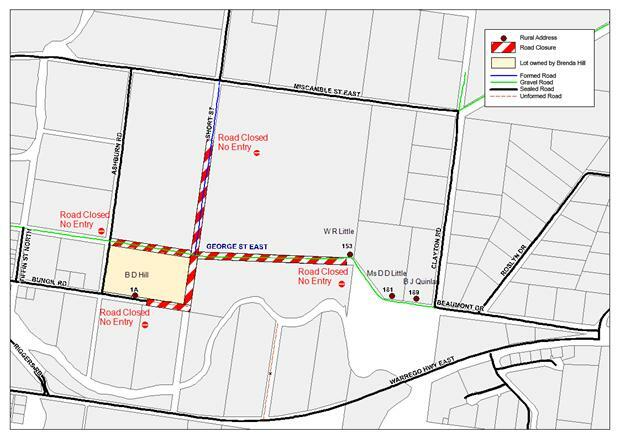 It should be noted that, because of the levee construction project, Miscamble Street East is currently closed to traffic and this may be impacting on traffic flow on George Street East (as an alternate route to Roma waste facility). In the current Register of Roads George Street East is classified as Rural Residential. Council adopted design standards for our road network in December 2013 (GM/12.2013/08). The standard for rural residential is based on traffic on the road. George Street East, according to the traffic count sample, has an average daily traffic flow of 99-135 vpd. Based on this, possibly skewed, data George Street East, if constructed now, would be sealed to a 7 metre width. However the retrospective application of this standard should be prioritized according to the adopted road hierarchy and the relative importance of a section of road within the hierarchy. Thank you for your letter that was received on 19 February 2014, in response to Council resolutions GM/01.2014/04 and GM/01.2014/05 regarding your request for a dust solution for George Street East. The matters you have raised will be fully investigated for consideration, and as part of this process, traffic count data will need to be collected. We expect our investigation to be completed by the end of March 2014, at which time we will provide you with a formal response. If you have any queries in the interim, please do not hesitate to contact Erin Tompkins in my office, or myself, on 07 4624 0677. I am writing to update you on your request for a dust solution behind your property on George Street East. That at George Street East, and the section of Short Street between the Archery Range and George Street East, be re-opened and available for use by traffic. This resolution has been passed onto the Manager – Roads and Drainage (North East & Central) for action. He advises that road closure signs and fencing have now been removed. That Council progress the request for a dust solution, in accordance with the adopted Dust Seal Policy. Council adopted a Dust Seal Policy on 26 June 2013. This Policy allows for Council to offer a subsidy of up to 50% of the total cost of works with the percentage of subsidy and total allocated funds to be determined on an annual basis. It also provides property owners with the guidelines for the dust sealing of unsealed rural roads. A copy of this policy is enclosed. Council held the 2013/14 budget meeting on 31 July 2013, and has allocated funds for the 50% subsidisation of dust seals. These funds are available on a first come – first serve basis. The policy details the guidelines for requests and processes involved. As part of the process an inspection is completed along with a cost estimate and report provided to Council. This process has already taken place. George Street East has recently had works completed on it and is in good condition. Additional pavement is required to construct the seal to the desired width. It is recommended that a 200 metre seal of 7 metres width be constructed for the level of dust protection sought. The total cost to complete the required works is $21,554.00 (excluding GST). As Council has adopted a 50% subsidy towards this cost this financial year your contribution, if you choose to proceed with this option, is currently calculated to be $11,854.70 (including GST). If you would like to progress the placement of a dust seal on George Street East please complete and return the attached Dust Seal Applicant Agreement Form to Council. An invoice will then be raised for your contribution. If you have any further queries in the interim, please do not hesitate to contact Kylie Fleischfresser, Specialist – Infrastructure Planning on 4624 0762 (Direct) or 1300 007 662 (via Customer Service). That Council consider this request, in accordance with the adopted Dust Seal Policy, in future budget considerations. Council has received a request from Brenda Hill for either increased maintenance - mainly road watering, some other dust solution or the road closure of George Street East between Ashburn Road and Beaumont Road. Ms Hill indicated that traffic along this section is causing a dust issue. Ms Hill’s property is adjacent to George Street East and her access is from Bungil Street. This road was inspected 3 December 2013. A temporary road closure sign with soft fencing was observed at the corner of Ashburn Road and George Street East, and at the corner of Short Street and George Street East. These had been tampered with and vehicles can pass through. The Manager – Roads and Drainage North advised that several efforts have been made to deter traffic from this section however road users continually pull signs and fencing down in order to access this road. Council has also received a letter from Ms Little, of rural address 153 George Street East, objecting to the road closure and requesting it be reopened as it is her preferred route to town and her only property access. Closing this section will add approximately 2km onto her route. Ms Little also states that she has had discussions with other residents of George Street East and they too want the road reopened. As part of the current closure Ms Little no longer has access to her frontage (approximately 670m) and she was using this to access the feed troughs for the cattle and sheep on her property. Ms Hill states that this particular section of George St East has not received maintenance for some time due to its temporary closure. Although no watering has been done in this time it should be noted that George Street East has received flood recovery works from the Natural Disaster Relief and Recovery Arrangements (NDRRA) funds through the Queensland Reconstruction Authority (QRA) for Events 1 and 4 to the amount of $99,801.82 and is currently in good condition. Option 1 That Council liaise with Ms Hill to construct a dust seal, in accordance with the Dust Seal Policy. Option 2 That Council seal this road, in accordance with the Request for Capital Uprgrade of Roads Policy. Option 3 That Council close this road, in accordance with the Local Government Act (2009). Option 4 That Council do nothing, lift the temporary road closure and continue road maintenance as per the road maintenance program. Council lift the temporary closures and liaise with Ms Hill to construct a dust seal in accordance with Council’s adopted Dust Seal Policy. This option is consistent with Councils response to dust complaints, and ensures that dust complaints are dealt with in an equitable and transparent manner. Council lift the temporary closures and seal this road in accordance with Council’s Policy Request for Capital Upgrade of Roads. Council close this road in accordance with the Local Government Act (2009). Residents of George Street East have already objected to the temporary closure and would oppose this solution. 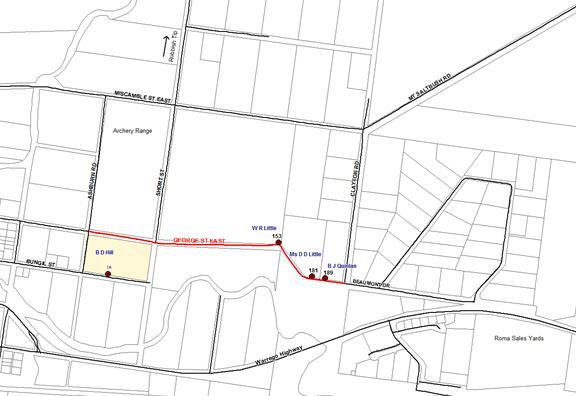 Closure of George Street East from Ashburn Road to Beaumont Drive would cut off access to 3 residences. Even partial closure from Ashburn Road to Short Street, although there is an alternative route, would be onerous for these access points for several reasons including emergency access. 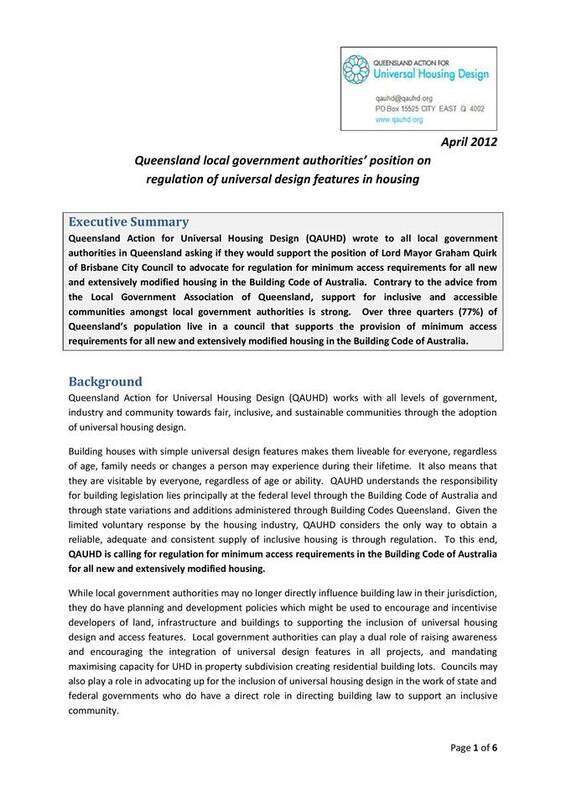 Furthermore, in submissions for funding for the emergent/reconstructive works on George St East Council has certified that the projects deliver value for money (VfM) as described in the approved VfM statement outlined in the Queensland Reconstruction Authority Submission Guide for NDRRA Funding Applicants. This information is collected pursuant to Part 2, Division 2 of the Queensland Reconstruction Authority Act (201). Should George St East remain temporarily or become permanently closed Council cannot demonstrate that the projects on this road have delivered VfM. 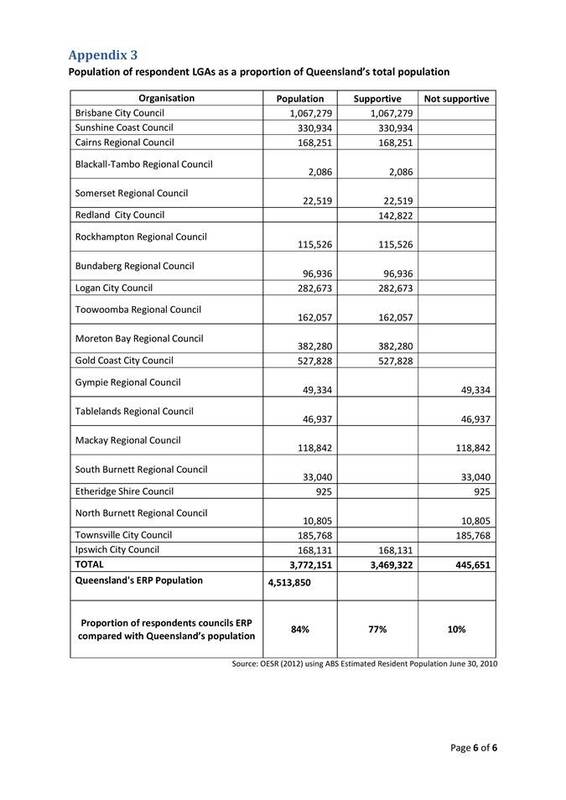 This may have financial implications on the recent claims and Maranoa’s ability to obtain future NRDDA funding. If Council proceeds with this option Council would need to ensure that an acceptable process has been used to ensure all parties are considered and treated in an equitable manner. (1) A local government may close a road (permanently or temporarily) to all traffic, or traffic of a particular class, if there is another road or route reasonably available for use by the traffic. (c) if it is necessary or desirable to close the road for a temporary purpose (including a fair, for example). (5) If a road is closed to traffic for a temporary purpose, the local government may permit the use of any part of the road (including for the erection of any structure, for example) on the conditions the local government considers appropriate. Council does nothing, lifts the temporary road closure and continues to maintain this road as per the road maintenance program. As Clayton Street and Miscamble Street East have now been sealed, through traffic on George Street East is expected to reduce. When a road is set aside and dedicated as road, the road is considered to be open: that is, available for use by the public as road. However, a local government may, under the Local Government Act, choose to close a road to traffic (for example, for works or for use as a mall). This type of closure to traffic is different to the closure of a road as provided for under the Land Act. Permanent road closure under the Land Act is the act of changing the status of the land from road to unallocated State land and then being able to sell or lease the land or reserve it for a community purpose (for example, a park). Road closure under the Land Act is only undertaken as a precursor to the reservation, sale or lease or other disposal of the land. Potential financial risk with recent and future NRDDA claims. Dust Seal Capital Cost of $21,554.00 (or $10,777.00 as per Dust Seal Policy) and an annual increase of $533.03 per annum in maintenance and renewal costs. Bitumen upgrade Capital Cost of $161,655.00 and an annual increase of $3,997.73 per annum in maintenance and renewal costs. In claiming $99,801.82 of NDRRA funds through the QRA for Events one (1) and four (4) emergent/reconstructive works Council has certified that George St East is an Essential Public Asset and that those projects deliver VfM. Closing this road may result in financial implications of these monies claimed and future funding. Nil, reverts back to the normal operating maintenance program.